What is Enzymedica Digest Basic? Enzymedica Digest Basic is one of the many supplements on the market that claim to address the digestive enzyme deficiency that arises from age, lifestyle, and diet. The supplement alleges it can also deal with the symptoms of these deficiencies such as bloating, gas, indigestion, irregularity, and other forms of stomach discomfort. The manufacturer claims it is a gentle solution that breaks down fiber, protein, carbohydrates, and fats. In addition, the supplement is credited with the ability to promote optimal digestion by helping the body to absorb nutrients well and convert food into energy. Lastly, the product boasts of being able to work six times faster and more effectively than other similar alternatives on the market. The aim of this review is to scrutinize all these allegations so that you can get a balanced and informed view of things before you decide to buy the supplement. The following are the ingredients that constitute the product. The main ingredient in the formula is Thera-blend enzymes. The manufacturer says they don’t include biotechnologically produced enzymes in the supplement. The recommended use of the product is one capsule with every meal. Users can take more if they need but the manufacturer does not clearly state how they can know when they need to increase the dosage. The retail price of the supplement on the manufacturer’s website is $9.99 for a bottle of 30 vegan capsules. However, no manufacturer discounts were accompanying the product at the time we were reviewing it. We have not come across adverse side effects that are linked to the consumption of the product. However, every potential user needs to exercise good judgment before commencing the dosage. First, all pregnant and nursing mothers should seek the counsel of a doctor before taking the remedy. Additionally, patients with chronic conditions and those on prescription medications will have to get the opinion of a medical expert before taking the product. The product doesn’t have a manufacturer’s money-back guarantee that can cushion a customer if it fails to deliver. Additionally, there are no user reviews on the maker’s site even though we found 207 verified reviews on a reputable online retailer’s website that gave it a 4.5-star user rating. 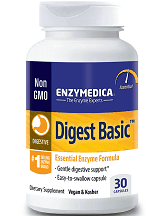 Enzymedica Digest Basic is a good product that helps consumers to find relief from the symptoms of digestive enzyme deficiency, and it is reasonably priced. However, this supplement has a few serious shortcomings that can push a potential customer to seek competitors’ alternatives. First, the product has no manufacturer money-back guarantee that provides a user with the much-needed fallback they can resort to if the product fails to work as per their desires and expectations. Second, the supplement has vague consumption instructions that ambiguously tell a consumer to increase dosage without clearly showing them how. This lack of clear dosage directions can lead to abuse and possible injury.